They Rule is listed on the Visual Complexity site, and is a wonderful example of a visual thinking tool. 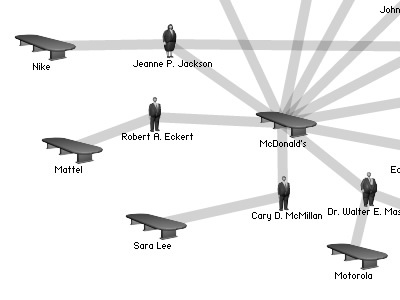 It takes a large database of information, in this case the board of directors for Fortune 500 companies, and shows their relationships in an highly visual and easily understood format. For instance, did you know McDonald's and Nike share a member of their board of directors?